Does Your Senior Cat Really Want to Live with a Kitten? Seriously, I could devote my entire career in cat behavior to diagnosing litterbox avoidance problems. It seems that cats miss their litter boxes more often then any other behavior issue and it’s apparent that we humans are having a hard time trying to figure out why this is happening in such sacred places as our bathroom sinks, tubs , beds, couches or kitchen floors. What motivates a cat to suddenly designate your back pack as the place to leave a present? Look to the litterbox. All of the answers lie in your environment. Let’s talk about expectations first. Is it just me or do we all just EXPECT a cat to enter our home and know where to poop? Technology, human convenience and laziness on our parts has made it almost an assumption that if you put a litterbox in your home, no matter what size, shape, type of litter or location…the cat will go there. This is obviously not true. Cats are picky and vulnerable when it comes to dropping their guard and going to the loo. They look for safe and easy places with no complications. Most likely, your litterbox located in the far back washroom, tucked under the sink, filled with colorful, scent fighting crystals will not be as attractive to your cat as it is to you. Kitty is looking for a basic bathroom with an easy entrance, no frills. un-scented, sand-like substances to cover up with and an escape route. The more complicated the picture, the less likely a cat is to be successful in your home environment. Cats are sensitive to change. They can react to sudden changes in environment by making some adjustments of their own. Ever go away for three days and come back to find that your cat pooped on your bath mat? Discovered a smelly gift on your pillow? When routines suddenly break, cats fall apart at the seams. Some adjust and roll with the punches, while others tend to just go south. What can you do to avoid such surprises? Don’t ever leave your home! Just kidding. No seriously, it’s all about keeping things consistent. Try to have a friend check in and maintain your routines. Sure it’s a lot of work, but no one ever said having a cat was going to be a low maintenance partnership. Don’t be fooled by gimmicks! No offense to the manufacturers of automated litter boxes, but cats don’t generally want a robot to clean up after them. That’s your job! Cats need efficient housekeepers that are ready to clean up on THEIR schedule. Also, some of these fancy boxes inadvertently make the box dirtier! Keep your litterboxes simple. Have more than one! Clean them like it’s an OCD of yours. Your cat doesn’t want to sit on a dirty toilet and neither do you. Find a litter that is appealing to the cat. NEVER use scented litter. Perfumed, chemical scents repel cats. Use a mild dishwashing liquid or hot water and vinegar for cleaning—not ammonia or other harsh chemicals which will leave an odor. Texture is important, too. Generally speaking, the clumping type or gravel type of litter is most acceptable. The sand type is very popular, but as a health precaution for kittens under four months old, it may pose a problem as they may ingest the litter. Cleanliness is absolutely essential! The single most common reason for a cat’s refusal to use a litterbox is because the box is dirty—no one likes a dirty bathroom. Clumping litter should be scooped daily, and the litterboxes washed weekly. Non-clumping litter should be scooped daily and the box emptied every week or bi-weekly depending on the frequency of usage. How many litterboxes do you need? Having one box per cat in the household, plus one extra is the best formula for success. 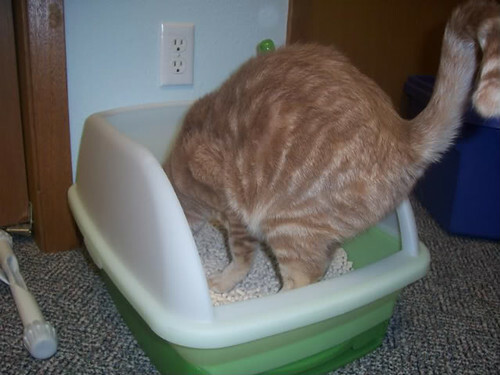 Being the individuals they are, some cats prefer to urinate in one box and defecate in another. Some cats will refuse to use a box that another cat has already soiled. Litterbox liners—they are often irritating to cats because their claws catch in the plastic. 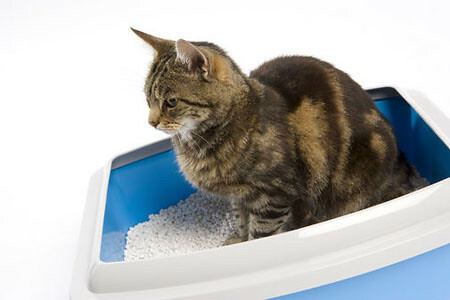 Covered litterboxes, or ones that are too small for the cat, may cause litterbox avoidance. Think about size too! Cats need to be able to spin around and sit upright when eliminating. 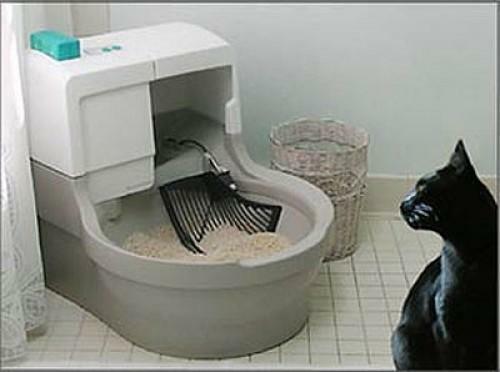 The best location for a litterbox is a quiet, private place where they will not be disturbed by people or other pets. Noisy areas near washing machines, furnaces or under stairs may frighten the cat away from the box. Never place the litterbox close to food and water dishes. So remember, remove your expectations and think like a cat. Sometimes the writing on the wall…bed or carpet…is a message telling you to pay attention to the space you are sharing. Don’t take it personally!